Prebook denne Capri-øya turen fra Sorrento, og unngå stresset i siste øyeblikk planlegging. Denne turen kombinerer et guidet aspekt med uavhengig utforsking, slik at du kan få mest mulig ut av reisen din. Først, vandre øya Capri i ditt eget tempo, og deretter cruise de omkringliggende vannet, med utsikt over områdets høydepunkter, inkludert de berømte grottene. I tillegg har du muligheten til å oppgradere dagen med en tur til Blue Grotto. We had a great day with Giovanni our tour guide who helped us maKe the most of the day covering all the highlights. Capri island has spectacular views and is very busy with tourists. 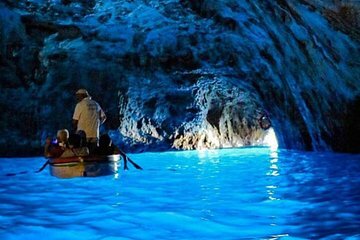 Highlights were the blue Grottos and the chair lifts which are a must do when in Capri. The tour was not what I paid for. When I booked the tour it was advertised as sailing from Sorrento to Capri. It certainly was not. We sailed from a port in Nerano, about a 50 minute drive after picking up passengers. Capri is a beautiful place. It is so crowded it is uncomfortable. The tour advertises ,"see up to four different grottoes on smaller local boats", well that didn't happen. We sailed past the grottoes on the ferry back to Nerano, The ferry did not come close to the grottoes like the small local boats. As far as a guide Maria did the best she could while guiding 2 buses of people! We had a very nice trip to Capri. It was a hot day and we took the mini van to Anacapri and Capri. It's worth the extra cost! Our guide was good. No complaints. Superb day. Not to be missed. All I can say is breath taking, they take you around the island explaining what the history of the Roman era. They they too it off by swimming in the bright blue waters. Then you tour the island with guide or no guide u get to see the top of the island where the view is to die for. I would recommend a lot. My wife and two kids 8,11 love it as much as I did. They have vest for the water for the kids and adults . Amazing wonderful enjoyed every minute. Maria our tour guide was great to keep us all informed and together. Contrary to what is said in the other reviews, we definitely had a lackluster experience in April 2018. Of the three tours we booked during our time in Italy, this was BY FAR the worst the other two were great. The description does NOT make clear at all that you are going to spend at least 45 mins potentially much longer, depending on what hotel order you are picked up in on a bus going to a different port you do NOT leave from the Sorrento port. Then, the communication throughout was TERRIBLE. None of the guests had any idea what was going on, there were no instructions at almost any point during the various transition points, and the gentlemen who eventually was the host on the ferry gave almost no interesting information at all and didn't even explain that the later tour around the outside of Capri would be after the 5 hours on the island. My husband was against purchasing the extra bus tickets that they sell which people leave good reviews about, and we did great using public transportation and saved money that way for sure. The tour ferry ride around the outside of Capri after the 5 hours free time on Capri was beautiful, albeit almost completely devoid of much commentary or educational information from the guide. So, if you are purchasing this tour, I think you are basically purchasing the ferry ride to and from Capri, and a boat ride around Capri. The price might be OK for that--I think some of the ferry rides from Sorrento are expensive. The tour company could improve by making the tour description much more informative particularly explaining the long bus ride at the beginning and end and having all of the their guides give interesting information and instructions during the tour. The grottos were beautiful and actually even emotional. No worries on missing out on the Blue Grotto either - didn't want to spend the time waiting in lines. One tip for our guide would be to clearly explain the tipping expectations for the crew. They offered all of us limoncello shots which some thought were free. But then they came around again later asking for payment which was a little confusing/awkward.